If you’re in need of a reliable ecommerce platform and need an unbiased Ecwid review, you’re in the right place. If your plan is to build an online store or add a store to an existing website, Ecwid is simply the platform you might want to consider. Ecwid can be added virtually anywhere. You’ll be able to install Ecwid on your current website, social media channels, and various mobile devices. Founded in 2009, Ecwid was released to simply ecommerce for small businesses by enabling them to add an online store to their existing sites. Today, their platform is used by over 900,000 merchants in 175 countries across the globe. It’s popular for a reason and that’s because it just works. Who is Ecwid good for? Ecwid is arguably the easiest ecommerce platform to work with (yes, it’s even easier than Shopify, see my Shopify review). It’s simple enough that even the most novice user can build an online store without any hiccups. Ecwid will give you the option to add a store to your existing website, social networking sites, mobile devices, or using their starter site option. The starter site is for those that want to create an online store separately from anything else. You’ll be able to use a custom domain name with this option. Due to its flexibility of adding a store virtually anywhere, Ecwid doesn’t have a limitation of what type of stores it’s good for. I honestly think their platform is the solution for any business out there that’s looking for a basic platform to sell products online. They even offer a free plan for those that are just looking to get their feet wet before committing to anything else. Ecwid offers a free forever plan that you can try here. When I want to build a store awfully quick, I turn to Ecwid. Their platform is ridiculously easy to use that anyone can use it without any major problems. Everything can easily be found, both on the admin backend and the customer frontend. For example, all of the store settings and configuration options are easily accessible via the admin control panel. Options aren’t hidden. The customer frontend is fairly basic and easily accessible as well. Your customers will be able to find the products they need with ease. There isn’t anything negative that I can say about their platform other than that it’s fairly easy to build a store here. Design is one area where Ecwid lacks options and selection. You’ll get one free theme that comes in two other colors, red and beige. You’ll only be able to edit it using custom css. If you’re using their starter site, it’s going to be fairly easy to adjust the look and layout of your store. Now if you’re adding Ecwid to an existing website and want to match the design of your website, things might get tricky depending on your skill level. However, their designers can help you match your store to your existing website design for $399. From the design page, you’ll be able to adjust the thumbnail sizing as well. When adding individual products to the store, you’ll be able to use their WYSIWYG editor to add product descriptions. On the plus side, you can purchase third-party templates that are compatible for Ecwid from marketplaces such as Theme Forest. The Ecwid storefront is translated to more than 45 languages. So when a customer enters your store, Ecwid will automatically detect their language by using your customers’ browsers language settings. However, the store owner has the option to force the translation to one language of their choice. Once you disable language translation, the customer won’t have the option to have the storefront translated into their native language. Either way, I think this feature is pretty neat and not available on most other ecommerce platforms. So if you’re targeting a global market, this is a feature that you might want to look into. Ecwid offers an app store where you can find various apps to integrate into your store. You’ll be able to find various design tools, marketing services, and shipping integrations that you can easily add to your store. Since their built-in features aren’t at par with other platforms, their app store selection makes up for it, but not by much. 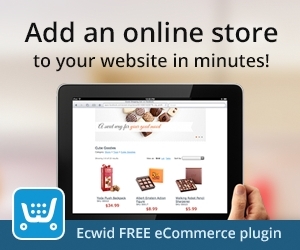 Ecwid offers a mobile version of your storefront for free. By serving a mobile version of your store, your customers will be able to navigate and make purchases from a mobile device. Their platform offers a responsive design so your store will dynamically adjust to best screen size to coincide with their device. With these options enabled, your customers will have a pleasant shopping experience on their smartphones, tablets, smart TV’s, and game consoles. Ecwid offers basic search engine optimization tools that’ll help you rank well on some of the popular search engines. If you’re on one of their paid plans, your products and pages will automatically be indexed by Google and inserted into their search results. If you’re not comfortable using this option, you can create your own sitemap and submit it to Google for indexing. The product information and any other page content is structured using micro-data which allows search engines to product rich snippets of your products and pages. However, there isn’t an option to add meta tags, create redirects, nor search keyword. Ecwid support department is open 24 hours per day, Monday through Friday. Their support department can be reached via phone, live chat, and email ticketing. Unfortunately, the free plan is limited to email support only. On the plus side, there’s a very active community forum where you can get help from other Ecwid members. There are several guides and tutorials that you can read if you run into a problem. If you plan on using their free plan, you’re better off trying to find answers to your questions in the community forum. Their support for the free plan is very slow. Since Ecwid is both a self-hosted and a hosted ecommerce platform, hosting and security will vary. If you’re integrating Ecwid into an existing website, everything will depend on the web hosting service you’re using. However, if you’re using their hosted solution (or starter site as they call it), it’s important to note that Ecwid takes care of the store hosting, security, and backups. Their hosting servers are optimized for speed so you’re customers can expect a smooth and quick checkout. They don’t advertise an uptime guarantee for their web hosting but from what I found, there are rarely ever any problems with their uptime. Their platform is Level 1 PCI compliant, which is the standard for ecommerce providers. Everything is stored on their secure servers. Since Ecwid is a cloud-based platform, updates are automatic without you having to touch anything. Ecwid stores your products data on their secure servers for easy backups. Their platform enables you add a store to any existing website or Facebook page. Storefront offers a responsive design that benefits mobile customers. 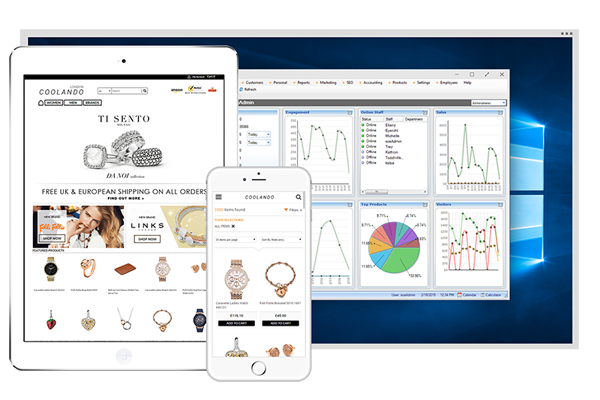 Ecwid is compatible with a point of sale system. They offer a free plan forever without any commitments. Their platform is multi-lingual, supporting 45 different languages. There are plenty of plugins for WordPress, Facebook, etc. The platform can be mirrored and duplicated onto various other websites if you plan on selling elsewhere online. Phone and live chat support is available on the more expensive paid plans. The platform requires manual coding and setup. Basic platform, not a feature-rich ecommerce solution. Is Ecwid good for my ecommerce business? Ecwid is a simple, cost-effective way to add ecommerce functionality to an existing website or placing an online store to a Facebook page. It’s also a good platform for starting a store from scratch using starter site option. However, getting it ready for optimal search engine optimization is a bit of a hassle, but not a major flaw. Ecwid is a neat platform for getting your feet wet and getting your store off the ground fairly quickly. If you’re willing to work with a basic platform that’s ridiculously easy to use, head over to Ecwid and sign up for a free plan.